Hence it is necessary for a prince wishing to hold his own to know how to do wrong, and to make use of it or not according to necessity. Therefore, putting on one side imaginary things concerning a prince, and discussing those which are real, I say that all men when they are spoken of, and chiefly princes for being more highly placed, are remarkable for some of those qualities which bring them either blame or praise; and thus it is that one is reputed liberal, another miserly, using a Tuscan term (because an avaricious person in our language is still he who desires to possess by robbery, whilst we call one miserly who deprives himself too much of the use of his own); one is reputed generous, one rapacious; one cruel, one compassionate; one faithless, another faithful; one effeminate and cowardly, another bold and brave; one affable, another haughty; one lascivious, another chaste; one sincere, another cunning; one hard, another easy; one grave, another frivolous; one religious, another unbelieving, and the like. And I know that everyone will confess that it would be most praiseworthy in a prince to exhibit all the above qualities that are considered good; but because they can neither be entirely possessed nor observed, for human conditions do not permit it, it is necessary for him to be sufficiently prudent that he may know how to avoid the reproach of those vices which would lose him his state; and also to keep himself, if it be possible, from those which would not lose him it; but this not being possible, he may with less hesitation abandon himself to them. And again, he need not make himself uneasy at incurring a reproach for those vices without which the state can only be saved with difficulty, for if everything is considered carefully, it will be found that something which looks like virtue, if followed, would be his ruin; whilst something else, which looks like vice, yet followed brings him security and prosperity. A modern Machiavellian? 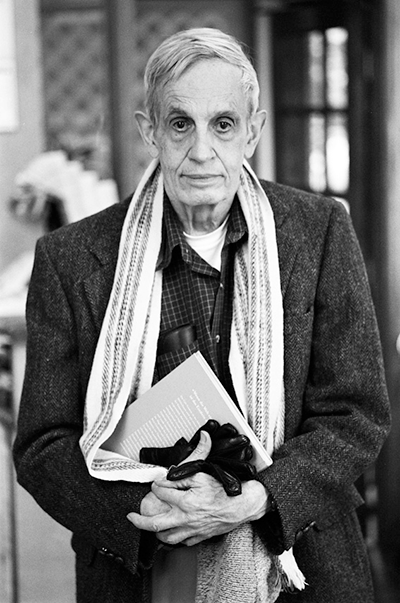 John Forbes Nash Jr. (1928 - 2015) mathematician, 1994 Nobel laureate in Economics, and a practitioner of Game Theory. His life was the subject of the movie A Beautiful Mind. Attribution: By Peter Badge / Typos1 (OTRS submission by way of Jimmy Wales) [CC BY-SA 3.0 (http://creativecommons.org/licenses/by-sa/3.0)], via Wikimedia Commons. Machiavelli, in this chapter, announces his intention to challenge the idea that conventional morality applies to a prince, i.e. an autocratic ruler, as opposed to a republic. In the next 3 chapters, he will contend that a prince, when acting as the head of state, simply cannot afford to abide by the same moral code that we consider commendable in a private citizen. In particular, we commend an ordinary person if he is generous, merciful, and faithful (true to his word). However, Niccolò believes that for a prince (in his public capacity) practicing these conventional virtues is so dangerous as to make it difficult for a prince to preserve his state. It is interesting that Machiavelli’s point here is completely compatible with a modern analysis. For example, we can make the same point in terms of strategy. Suppose that we think of each prince as having a choice of two strategies: virtue and vice. Obviously, it would be best for all concerned if every prince chose virtue. But there is no path of logical reasoning that could lead competitive powers to cooperate by simultaneously choosing the strategy of virtue. Each prince can reason as follows. “If my opponent chooses vice, not only will he enjoy a dramatic competitive advantage (i.e., he will profit more than I do), but he will profit at my expense. Thus he will grow stronger while I grow weaker. I cannot allow this to happen, therefore, I too must choose vice.” Strategists who study a branch of mathematics called Game Theory, refer to this dynamic as “The Prisoner’s Dilemma. I do not contend that Machiavelli anticipated game theory, merely that his ideas have weight because they have not been overthrown but rather confirmed by modern analysis.